Do they stay in the mister, or do you transplant them? if you transplant them how do you deal with all of the loose roots and gets them set up in the soil properly? I usually just transfer the net pots into larger ones and then into bubble buckets (5 gallon buckets with airstones at the bottom) for any fruit producers. They’ll get some serious roots going on later in life. For smaller stuff, strawberry’s, lettuce, spinach etc you can keep them in a setup about this size without too much trouble (probably a little bigger, I use a 12in deep container for lettuces.). Now let’s compare the calories of electrical input with the calories of food output…. the results are obvious. so? that real life you wont get something for nothing. its an obvious energy-time tradeoff. do you get more per square foot by using solar panels to power the growth boost? would a larger crop just give more? Well, given that a properly grown plant can produce 80 tomatos (http://www.gotomatogardening.com/2008/11/21/how-many-tomatoes-do-you-get-per-plant.html) and a tomato is 22 calories (http://www.thefatlossauthority.com/fat_loss_tips/tomato-nutrition-facts-how-many-calories-are-in-a-tomato) and he has 6 plants, that means the tomato energy is on the order of 12kW*hr in a season (http://www.wolframalpha.com/input/?i=6*80*22+dietary+Calories+in+kW*hr). Not, I was not able to find energy information on the mister, however an eBay link says its power supply is 24V at 800mA which feels quite high, but at that you are consuming approximatly 14kW*hr in a month. Now I know a season is more than a month, but what this says is that if you grew them for 4 months you would be 20% efficient (in terms of enegry) that’s pretty good. Also as is discussed below, you could rig the mister to a timer or sensor and not run it all the time as well. So if the mister only run for half the time you are up to 50% efficiency. All things considering that’s pretty good if you consider the efficiency of commercial food production. you would be 25% efficient. Not sure what I was thinking, I guess you could be 20% if your season was 5 months. Either way. Still respectable. The above doesn’t account for the light and other factors, but in terms of the mister, it really isn’t using that much energy. If you want to talk cost. 1kW*hr typically costs 10 cents, so you are looking at ~$1.50 extra a month to run the mist…. if you compare that to the cost of tomatoes then you are WAY ahead. Right, because efficiency is bussing your food around in plastic packaging on the back on 18 wheelers. Local is good, and it doesn’t get much more local than your house. Agreed. Driving to the grocery store puts more gasoline usage into produce than shipping does. This project is awesome and could give small growers a huge advantage. Common guys don’t be jerks this is a pretty cool lil project. This is awesome. I’m making one. Wow! The difference is amazing! It would work well from lettuces/greens but the roots need a lot of room for tomatoes/peppers in my experience (5 gallon bubble buckets have been my finisher of choice). Also make sure you provide enough light. People concentrate on the nutrients thing too much sometimes, lights will make or break you. yes it absolutely can! but start your seedlings outside to so you dont stress them with the increase in light brightness. Very nice writeup! I’ve been growing herbs in an aeroponic setup for a couple years and just wanted to add some long-term tips. I would suggest wrapping your reservoir in something opaque to prevent the growth of algae. Adding an aquarium air pump and air stone to the reservoir will help oxygenate the solution a little more and discourage bacterial growth. Priming your rockwool with a little lemon juice helps normalize the pH a bit, and will help your seedlings start a little faster. Speaking of pH, it’s important to keep an eye on it and adjust as necessary. Large pH fluctuations will prevent your plant from taking up different nutrients. Great job on the project and good luck! Sounds like a definite improvement, but how much mist does this push out of the aeroponic setup? Increasing the room humidity, or dried nutrient deposits caking on the walls/floor around the setup, are both things I’d like to avoid. I run a sprinkler in my setup, so it would be hard to say if a the air stone(s) create enough mist to leave deposits. My guess is that with a deep enough reservoir, you wouldn’t have any problems. Most air pumps will be adjustable, too, so you can tweak that. Even with my sprinklers, I haven’t noticed a humidity change. I think my a/c and heater are enough to regulate it. Your dead on with the air pump. it will displace the mist and thusly push air, water and nutrients out of the tank. the net pots breath alot so its not critical to put in a air pump as you cant increase the surface area of the water vaporized more than it is. Do you have a website or resource you’d recommend for doing either hydro or aero? The idea of growing fresh herbs in an apt on the 14th floor is pretty sweet. Depending on where you live, my best resource has been a local shop. Here in Raleigh we have “5th Season Gardening” and they’ve been a huge help as I’ve been experimenting over the years. Other than that, there are a ton of different instructables on all kinds of different systems. Herbs and greens/lettuces are a good place to start, I’ve always had trouble with fruit bearing plants. I drew from a bunch of different sites and did my research a while ago. I’ll see if I can dig up some resources for you. I have been thinking of building something similar to this for quite a while, but i was thinking of using LEDs. Not only red and blue for the plants, but also UV to kill organisms in the nutrition fluid (only exposing the fluid and not the roots). Anything in the nutritions that’s sensitive to UV or any other reasons why it wouldn’t be a good idea? Ooh, that sounds like a neat idea! I can’t think of any downside to that. The nutrients are just minerals and salts. I don’t have any personal experience with LED’s, but I’ve read that they aren’t quite ready for this. I have seen people use them with success, though. If you’re just doing herbs, you don’t have to worry much about the red spectrum. Blue-heavy spectrum is what plants need in the vegetative growth stage. Red is for flowering/fruiting. UV sterilizers are often used in planted aquariums that use nutrient solutions similar to those in aeroponics. In theory, they may convert some nutrients to forms unavailable to plants. But in practice, no one has ever complained or reported an actual deficiency due to use of a UV sterilizer. Note that common UV LEDs emit light in the wrong portion of the UV spectrum to effectively kill anything. Specialized germicidal UV LEDs are available, if you don’t mind paying hundreds of dollars. So for now at least, go with an old-fashioned germicidal fluorescent. Make sure it’s *really* a germicidal tube, your average blacklight won’t work. The ultrasonic transducer sterilizes the water. Really. Would the plants get the nutrients they need if I use a sonic transducer? Will the water need refilling more often? Not really, cyanobacteria also known as brown algae infections are not prevented. The prevalence of that depends on water quality, so either distilled water or a very small amount of algaecide is recommended if problems occur. Is it just me or do they not look all that healthy? I cant imagine them getting as much nutrients / minerals as soil grown vegetables. actually the get more nutrients and minerals that soil grown vegetable thats why they are so big. they probably will look a bit strange due to the lamps not having the proper light spectrum.if power/money is not an issue metal halide/high-pressure sodium lamps or blue and red leds might be use to get an even bigger boost. While I’m not sure of the science of it all, I know that plants actually make most of their needs. If you used a measured amount of soil in a pot, grew a huge plant, then washed the soil out of its roots, the soil volume would be nearly identical to what it was before. They do like some micronutrients, such as those found in Superthrive (which smells really odd, by the way) but many plant cuttings can live and thrive in a glass of water. In fact, you can preserve your outdoor tomato plant to get a head start on next year’s crop by taking a big cutting before the first frost, and keeping it indoors for the winter. They’re technically a perennial, but they’re not frost hardy. They’ll grow to resemble a small tree if they get the chance, just try growing a Brandywine or Pineapple heirloom tomato! A bit ignorant on this so please dont make fun but would this have any added impact if it was also inside a greenhouse? @Panikos – If you put the system *as is* in a greenhouse, nothing changes.. except more sunlight and warmth. This is a well written instructable, with as much attention to the guide as the photos. Well done! One thing that keeps me from *ponics is, my understanding is you must THROW AWAY the nutrient solution after about a week. Even though there may still be some nutrients left which you could “top off” or add more concentrate to. This seems wasteful. Can someone comment on the waste water? Is it safe to recycle in any way? I have a summer garden, and a compost pile. I’d rather dump the solution on one of those, than down the drain. The mister needs a certain amount of time to fill the container with mist. Anything above that is just going to cause the mist to bellow outward through every possible hole in the lid or container. If you put a humidity sensor inside you could presumably run it constantly for a certain amount of time to reach the desired level then operate it only occasionally to top off as the level drops, but I’m not sure you’d save much power (powering the sensors would probably cancel out the power savings from the humidifier itself – the power draw is fairly small). Mythgarr – My take on it is a ultrasonic mister will draw MUCH MORE power than a powered Arduino with a humidity sensor (and even less with an ATTINY85 + sensor). A sensor and microprocessor draws very very little (could run on a single AA – with 1.5v to 5v booster circuit – for a month). Adding a relay switch will increase the power drain, but it would still be very low. I expect you could not power the mister off a AA for very long. If you keep everything free of bacteria (poster above had a neat idea for UV light) and regulate your pH and PPM, you can go for quite a while without a water change. Water changes are nice for a “clean slate” if you’re having problems, but once per week is a huge waste of nutrients. And yeah, I kept my waste water in gallon jugs and used them to water my houseplants with no problems. Scott, I don’t know much about *ponics directly, but I know plenty about high-tech, heavily planted aquariums. They seem to be very similar, with the only difference being that the nutrient solution is diluted in a much larger amount of water. The problem with topping off a nutrient solution is knowing which nutrients are needed. You’d need a reliable (expensive) set of test kits for at least the major nutrients (N/P/K/Fe), and test regularly. Or you’d need to wait for visible deficiency/toxicity symptoms to show up, be able to accurately interpret them, and adjust your dosing regimen accordingly; which takes a lot of practice. Either way, you’d still be in the dark about most trace nutrients (test kits not available, visible symptoms ambiguous). That’s why it’s common practice when running planted tanks with chemical fertilizers to dose slightly more than you think you need, then do a 50% water change once a week to remove excess. Much like throwing out the *ponic solution. Many of us planted tank geeks buy common agricultural fert components in dry form, then make our own dry or liquid blends. A small amount lasts a very long time, so the cost over time is trivial compared to other costs (like lighting). My first $30 order of dry ferts lasted me six years before I ran out of *one* of the components (and I still have plenty of most of the others). Premixed liquid solutions marketed for planted tanks are marked up at *least* 2,000%, and for that you get a lot of water and packaging, but little actual fertilizer. It’s probably similar for *ponics. Some of us have environmental concerns regarding disposal of the wastewater too. Yes, you can put *some* of this in your garden/lawn; though for a *ponic solution, I’d think diluting it first would be wise. But not too much. I hear some nutrients (notably phosphates) bind strongly to soil and won’t be washed away by rainwater, so they can build up to toxicity if they’re added faster than they’re consumed. On the serious side, the right question would be how much does it cost (in electrical energy + prorated material cost) to get you crop days/weeks earlier. Not to say larger plants, less days you burn expensive lights, 2+ weeks earlier on the market (or into my salsa). for those of us that use some electric heat, using HID lights to grow plants in the winter makes perfect sense- at least we get a yummy byproduct when we are heating our house. I’ve been trying my green thumb out with various brugmansia though they don’t seem to live long. This ultrasonic fogger method just might do the trick. As a kid I recall having a humidifier with the ultrasonic fogger mechanism so if anyone has a humidifier they were going to throw away it could be salvaged for a project like this. Thanks for sharing! I tried this a while back and found that the ultrasonic misters where not reliable enough for their cost. Even with teflon coated transducer heads they would wear out quickly. It’s too bad as it seemed like a reasonably good system. I’ve heard this as well and it’s one of the things that made me decide on a sprinkler type setup. At $6 a pop, though, I might give them a shot in my next experiment. I have a sprayer system based on a submersible pump that works pretty well using micro-sprayer heads from Home Depot. I’m sure it’s nowhere near as energy efficient as these, and I have to soak the heads between crops to get them degunked but they seem to work well enough. I do like the fact that Jared attempted to use a control (a regular potted tomato plant) in his experiment. Proper scientific methods aren’t done very much anymore, IMHO. The question I have is “Why a high oxygen environment”? I would think that using the standard 78/21.5/.5 N2/O2/CO2 mix would work just as well, and that bumping up the CO2 percentage by .5% would work even better. Supposedly, this is what some greenhouses do. Now, having made my pitch for increased CO2, I will note that once I did a similar experiment on tomato plants using the exhaust of one of those super-efficient flash water heaters. Supposedly, the exhaust of those things is just CO2 and H2O vapor. What I forgot to realize was that using such a high concentration of CO2 changed the pH of the H2O — effectively, I created acid rain and killed the tomato plants. I assumed by “high-oxygen” he just meant the increased aeration of the roots from having them being misted instead of suspended in hydroponic solution or buried in soil. Roots of course would only benefit from increased oxygen–they don’t use CO2. Oxygen in the rhizosphere (root zone) is necessary for healthy plant growth. As aeroponics is conducted in air combined with micro-droplets of water, almost any plant can grow to maturity in air with a plentiful supply of oxygen, water and nutrients. Clean air supplies oxygen which is an excellent purifier for plants and the aeroponic environment. For natural growth to occur the plant must have unrestricted access to air. Plants must be allowed to grow in a natural manner for successful physiological development. The more confining the plant support becomes, the greater incidence of increasing disease pressure of the plant and the aeroponic system. OK, so I take it the solution is to mist a higher concentration of O2 in the root zone, and a higher concentration of CO2 in the leaf zone. Exactly. O2 to the roots, CO2 to the leaves. It get’s even more fun than that. Higher O2 during lights out, higher CO2 during lights on. I believe the Dept of Agriculture accidentally found out what high levels of CO2 do. They were trying to study how trees deal with higher CO2, so they injected a forrest with CO2 (pretty insane setup). The trees did grow a bit faster, but the poison ivy took over the ENTIRE area. The trick is to find the plants that won’t inhibit their growth given unlimited resources. I’ve been thinking of trying a hydroponic herb garden for some time (fresh basil costs $$$) – this seems like a more viable solution for us. Only problem now is where to put the thing. You’d be surprised how well a pot in the window will work. I have two basil plants and can make fresh pesto once or twice a week. But hydroponics are fun . 79 – 82 degrees that seems a bit high for a hydro system. im assuming that youre leaving the fogger on and dont have any sort of timer setup going. you may want to switch to a larger reservoir and start using a “float” for your fogger. or if youre not already doing so use a timer and set it up to keep your roots moist/damp but still have a maintainable water temp. Another interesting thought I’d like to suggest is using cuttings rather than seedlings. Tomato plants are extremely happy to grow roots when placed in a simple glass of water, let alone a complex hydro/aeroponics setup. I bet you could take cuttings from a mature plant in the fall, and overwinter them. Perhaps they wouldn’t produce a great volume of fruit in the ‘off season’ but they’d probably survive happily in the absence of frost. If you’re bringing them indoors, you have control over the season. It’s all about light exposure. I’m wondering about mineral buildup on the mister over the long term and reliability. I’ve been thinking about implementing a sprayer system for a while now with scheduled spray, nutrient addition, and warning system. Also placing the system in a greenhouse to use natural light during the day and perhaps supplement with artificial at night. I highly recommend this, especially during fruit production. I’ve always had trouble producing enough light with CFLS/LEDs to really have a tomato plant do well and investing in some real lights isn’t really in my budget, I’ve just been experimenting with different hydro setups. Through vegetative growth they seem to do fine, like he’s shown here but from there to the finish my stalks get weak and the tomatoes are few and far between. Lettuces seem much more practical for a full indoor grow. this makes me want to grow some plants. shame I don’t have a signal dollar to do it. but I think I may make a trip to the library and start reading up on the subject. it’s probably best if I do this before I start growing anyways. Combine this with their upcoming aquarium management and they’ve made food security for all, if you like eating fish and tomatoes every day. Replace the fertilizer with tank water, the fish fertilize it every day. Yes! There are some very successful hydro systems in use that are almost completely self-sustaining. All that’s needed is feed for the fish. Really amazing stuff. Well depending on the fish you can feed them with parts of the plants like shredded leaves (Talipi/Carp for example would work) and you could use water-spinach in the Aquarium. Seed some duckweed among the water-spinach and you could lower the food consumption of the fish even more. The biggest issue with the ultrasonic systems is the salts and scaling that build up on the discs after long term exposure to tap water and nutrients. Depending on the item they may have replaceable discs. I purchased mine as a pond fog and light display from ebay. It came with a replacement disc. I opted to sue mine as a separate humidifier to my plants with pure RO water to help extends it’s life. Algae is a real threat to Hydroponic systems. It gunks up the equipment and can kill the roots/plants. Black PVC buckets and shields over the hydroton are the best ways to keep algae from getting in there. That is totally true! Algae is a major issue with hydro. light + nutrients + water = algae. algae its self is not harmful, but it can clog systems and leach nutrients meant for your plants. As this was a simple experiment i didn’t care to take the time to spray the tank black, but i recommend this one mod. If you do DWC or a drip system black buckets are ideal, but hard to find and expensive. As an alternative lowes has there branded buckets that are grey that work perfectly as they are not opaque. Do not use the orange opaque home depot buckets or a white bucket. Would running the water through an activated charcoal filter remove enough salts and scaling compounds* to increase the lifespan of the discs? *I don’t know what causes scaling. The foggers used in these systems are the exact same ones people use when they buy those mist lights (little glass bowl that usually glows and produces cool fog) The fogger uses the same electricity as any other household appliance would. In door gardening is not done to save energy but instead to produce (whatever you grow) all year around. The idea has been around youtube is full of examples, but this write up is very nice. I searched all the comments and not a single question about the taste of the resulting tomatoes! I remember 35 years ago when my dad’s boss converted one of the labs in their engineering building into a hydroponics tomato garden. The results were astounding… huge plants and huge tomatoes in 1/2 the time. The only problem? The tomatoes were the blandest things you had ever tasted! They couldn’t understand why because they had the chemistry dialed in perfectly. Show me the results of the Taste-Off and then I’ll start building! I’ve got some tomatoes in 5gal buckets in my yard…but this is way cooler, i have some Bhut Jolokia chili pepper seed i have been waiting to grow, this might be a killer setup, any thoughts? I have a couple, actually. I tried to grow habaneros. The plant went absolutely bonkers in vegetative stage, but I couldn’t get it to pollinate by hand. Keep it outside, and iirc, peppers like a slightly more acidic pH (confirm this). Yeah, bhut jolokia’s ought to grow fine. Re. sonic transducers being temperamental. I’ve had this happen, it seems that the cheap modules overdrive their transducers to get more fog which wears them out. Rumour has it that the failure mode is internal heating which depolarises the ceramic. This can in fact be fixed by heating up above the Curie point under oil and then re-poling with a high voltage. Wonder if anyone’s tried using one of those 445nm LD’s and an old laser printer block and spinning mirror as a scanner? Scan the grow volume and exploit the higher efficiency of laser diodes compared to LEDs. Last time I checked they were nearly double which is substantially better power-wise than even halogens. Perhaps someone should do a phlatlight/445 version of this, with c@s!o projector parts? that would be a wonder to behold. Waste heat from the diodes should be pumped into the grow volume, as this will increase efficiency. Interesting, you’ve given me some things to look into. But no need to scan a LD. Uncollimated LDs are already rather diffuse, and can be diffused further with a simple lens. Plus pulsed (or scanned) light offers no benefit. Plants grow based on the average of the light received, not the peak intensity. actualy thats only partly true some research on algae suggest that photosynthesis can be “overdriven” slightly by using hi intensity light pulses.the theory behind this is similar to pwm instead of using hi intensity continuus light which might damage the plant using pulsed light enabels you to get more light to the plant without damaging it. the cumulated light pulses averages to more that the normal ilumination you would normaly use for the plant. 1.) Spectrum dial-in using LEDs. Plants DO use the entire spectrum, but certain portions of the spectrum absorb more efficiently and also alter the plant physiology. For artificial light, you’re looking at both energy efficiency and growth multipliers. As has been mentioned, blue light for growth, red for flowering/fruiting. 2.) Speaking of spectrum, the use of UV and Far Red light has some interesting effects on plants. Using Far Red, you can fool the plant into thinking a day is longer than 24 hours. 3.) Once you’re off the spectrum experiments, you can jump into PWM land, pulsing the light. Lots of research into maximizing light absorption by pulsing the light with a 50% duty cycle at specific frequencies (712Hz is the growth sweet spot, 480Hz is the energy efficient sweet spot). 4.) Nutrient delivery methods. Ultrasonic, high pressure mist, low pressure spray, ebb/flow, etc etc etc. They all have their up and downsides. Ultrasonics are awesome, but the reliability of what’s out there kind of ruins it, not to mention calcification on the discs themselves. There is a lot more to it. NASA has some great research (publicly available papers) on growing indoors (long term space travel food supply) and there are a LOT of academic papers as well. Beyond that, LEDs *ARE* there now, you just can’t use the 5mm variants. Pick up some 3 watt of above power LEDs and go at it. Maybe some day, I’ll post up some of the stuff I’ve been doing. Lastly, outdoor hydro is awesome. You can create dense gardens (space efficiency) and grow REALLY fast (important for us snow belt people). As for anyone saying the taste isn’t there… you’re either using the wrong nutrients or the wrong plants. I’ve personally ingested some Bhut Jolokia (Ghost) chili peppers growth INDOORS with hydro. They tasted excellent for approximately 500ms, then I wanted to die afterwards due to the heat. All in good fun. What effects would this have on plants? Especially during the vegetative phases it means you can bulk up the plant mass with less overall energy investment. However the PWM methods are also very effective for power savings and making a plant think it has received more light overall than it actually has. Remember that plants are like batteries. They save up sunlight in the form of sugars to feed them self’s during the night. plants grow larger to increase their capacity. but the rate they convert sun and nutrients to sugars is limited by resources and chemical / enzymatic reactions. So using less energy or differing forms of light that make the plant grow faster is the ideal result of these experiments. Though reds are used more in flowering and blues more in vegetative growth. So far red is likely for something producing seeds / flowers (wheat) and reds are more for succulents (lettuce). In most studies though, LED is still just not up to par with HID systems. Though augmentation with leds has shown major positive impact. >>BLUES<< are more for succulents (lettuce). The suspected mechanism behind using far reds, is that during sunset, “far red” is very prominent. The experiments out there show that when the main lights go off, you blast the plants with about 5-15 minutes of “far red”, and it simulates upwards of 2 hours of dark period. This goes against the OP of running his lights 24/7, which actually stunts growth. The typical photo-period for tomatoes (and weed) is 18/6 for vegetative, 12/12 for flowering/fruiting. Different plants vary, but that’s the basic formula. So, by being able to artificially add 2 hours of dark, you can run 18/4 and 12/10 cycles, meaning you get 1.08 growing days per actual day. Also, for everyone making the joke about growing illicit crops, those guys are driving a good portion of these experiments. As a side note, I still disagree with the notion that “LEDs aren’t there yet”. There are LEDs on the market today, that surpass every other form of artificial light, other than the super expensive/rare plasma bulbs. The other benefit is, as the OP showed, you can push LEDs right up against the plants (like CFL) without burning the plant with heat. Can’t do that with Sodium, MH, nor HID. *EDIT* To clarify, far red tricks the plant into quickly switching to the metabolic/chemical processes that happen at night. By enhancing this process, the plant doesn’t require as long of a dark period to recover. Also, prior poster is dead on with the PWM pulsing. You’re essentially giving the plant a chance to recover, before being bombarded with more photons. Do I need to dive further into optimizing CO2 concentrations, O2 injection into the root mass, or barometric pressure control? LOL. Tomatoes are a direct analogous plant to that which you allude to. Just in case you’re interested. You can test growing theories on tomatoes. In response to a poster above, I’ll qualify my statement about LED’s. 2-3 years ago is when I did all my preliminary research, and while there were many manufacturers selling LED lights for plants, the people on various forums said they were getting spotty results. 2-3 years is a long time as far as LED’s are concerned. I wouldn’t be surprised to learn they’ve broken the barriers. I’m about to start my 3rd iteration of my herb garden soon, thanks in part to this post. I might try to hack an arduino into it for giggles ;) If I do, I’ll post. For those curious, here’s a photo of my last herb garden. They’ve come leaps and bounds from 3 years ago. Both Cree and Philips have both developed and released LEDs that have the highest lumens/watt out of ANY light source (again, other than plasma bulbs, but good luck finding one, let alone affording it). Also, the LED lights on the market right now are under powered, over priced, and don’t have ANY of the features mentioned above (by me and others). No science behind them, just throwing a ton of LEDs together. Again, I’ll be posting up something soon (once work lets up) of one of my side projects. Maybe I can get my partner in crime to submit something to hackaday on his outdoor, low dollar, highly effective hydro setup. I’m very familiar with a certain type of POTted plant and that second one in on the right is NOT a tomato plant. Not with those jagged leaves. Prolly not the best pic to use. Great idea and I and others will try implementing it. its always nice to see another ‘growers’ setup that brings a bigger yeild. They all look like tomatoes plants to me. Some varieties have have very frilly leaves. they are roma tommatos you knuckle head! This is a nitpick, but I’d round out that hole for the power cable. Then I’d put a drilled rubber bung (like a #3 or #4) in it. Using a bandsaw or careful razor, you could slit open the bung on one side so you can get the power cable in (the alternative is don’t cut the bung, and cut off the plug of your power cable and route it through the bung). This would look neater and more polished, and keep the box from overflowing mist out the hole. Nice to see you growing your own. As far as i can tell,this is just a simple aeroponic set-up.Nothing new or different about it. I will give you the benefit of the doubt and assume you have just got your words mixed up,somehow. The mist is ATOMISED(turned into really small droplets). Yup, you’re right, ultrasonics are sounds WAY up in the sound frequency… which happens to cause liquid water to atomize (yeah, not the right word, but everyone uses it in this context). So, it is an ultrasonic mister (nebulizer) used for aeroponics. 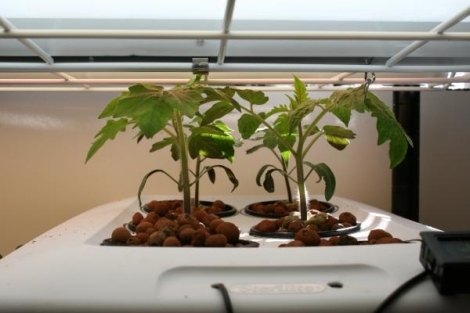 Other devices are also used in aeroponics, this is just one of them.